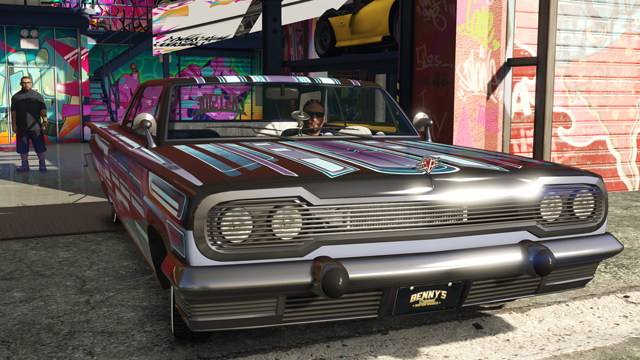 GTA Online: Lowriders is now available for PlayStation 4, Xbox One and PC as an automatic update. This latest addition to GTA Online features Benny's Original Motor Works, the hottest vehicle customization garage in Los Santos. 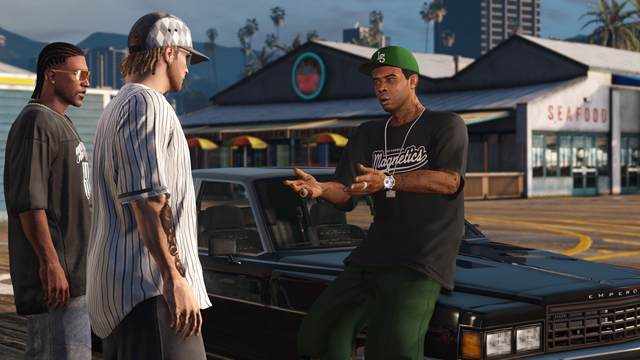 Located in Strawberry, just south of the Olympic Freeway, Benny's specializes in custom Lowrider modifications for select vehicles including two brand new rides - the Declasse Moonbeam van, which allows for two-handed weapons to be fired from the back doors - and the Willard Faction as well as four classics already in-game. Another satisfied customer exiting Benny’s Original Motor Works. Enlist your friends and Crewmates to help Lamar take on the Ballas and Vagos. Meanwhile, Lamar is hatching a scheme to become the ruler of Los Santos’ Lowrider scene, and needs some loyal subjects to help put him on the throne. To do so, you’ll be taking on the biggest gangs in the city through a mix of subterfuge, skill and pure firepower. Keep an ear out for Lamar’s phone calls and tackle eight new Contact Missions charting his quest for power. Fresh arrivals at Ammu-Nation include the rapid fire Machine Pistol and the devastating Machete. While you're there, why not pick up newly available luxury weapon finishes for a selection of existing weapons including the Special Carbine and Assault SMG. You’ll also notice that Ammu-Nation has reorganized to make room for all the new weaponry. Keep the Pace - Stay above a minimum speed while racing around courses littered with jumps and obstacles. If you slow down too much, you’ll explode. Offense Defense - Teams of two split into Runners and Protectors. Runners aim to be the first to get to the end of a route. Protectors, in faster and more powerful vehicles, must block and run opposing Runners off the road, while protecting their Runner from the other teams. Relay - A team Race in which players take turns, each completing a lap before tagging a teammate. Non-active drivers wait in the pen to be tagged, while active drivers complete a lap for their team. Expand your property portfolio up to a maximum of four Apartments or Garages. There's never been a better time to purchase that extra space to store all these new custom Lowriders - and from now through this Sunday October 25th, Dynasty 8 is offering a one-time 25% REBATE on your next qualified purchase of a property with a 10-car garage. Qualifying is easy - just have your email address verified with the Social Club, be on the Rockstar Mailing List and be a member of any Social Club Crew. To fulfill the requirements, login to your Social Club profile - and if you're already qualified, just purchase any property with a 10-car garage. It’s all in the details - customize your rides from bumper to bumper and everything in between. 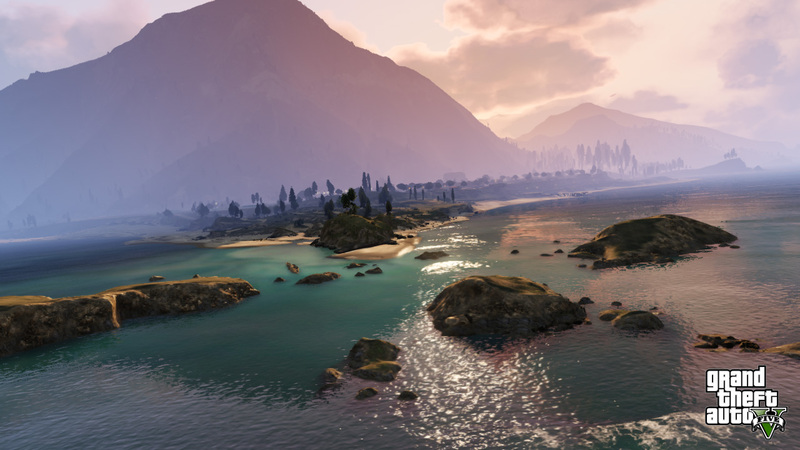 The Scene Creator is a brand new feature added to the Rockstar Editor's Director Mode, enabling you to create custom settings for capturing your Rockstar Editor clips. Select from over 200 available props (including explosives) and position them to create the perfect backdrop. You can also save up to four scenes so you can reuse them whenever you like. Destroy Last Place: A new option has been added to Races, upping the stakes for those in the back of the pack. The host can set it to be effective each lap, every 15 seconds, every 30 seconds or every 60 seconds - and the player in last will be blown up at the corresponding interval. If there's something you'd like to see added to GTA Online in a future update, make sure to email Rockstar Games directly at [email protected]. Enjoy and show off your rides in the forums! From Rockstar: "For [people] asking about why this update is not available for PS3 and Xbox 360, as previously mentioned here on the Newswire (http://www.rockstargames.com/newswire/article/52429/asked-answered-the-rockstar-editor-gta-online-updates), future content updates such as this are only possible on the newer and more powerful platforms. As there is not enough memory available to add the game on to the older systems, we cannot make any more meaningful content updates without putting the entire game at risk." It's definitely disappointing for people who don't have new gen consoles or PC. WHY ROCKSTAR WHY NO OPDATE TO PS3 comon we wandt it too use the old engin to run it fore love of god you made Many old opdates all that " is to new gene " do not put it like that!!!!!!!! 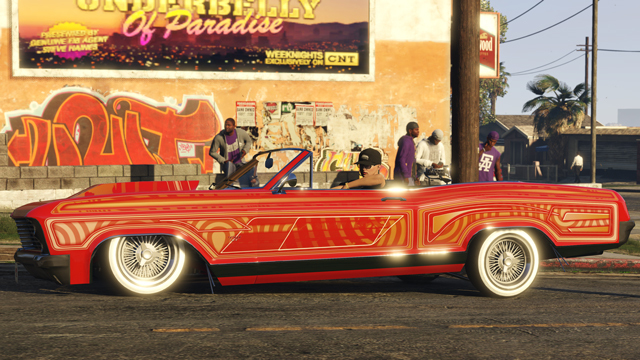 Lowriders Update Now Available - The latest DLC hits the streets of Los Santos: Lowriders.